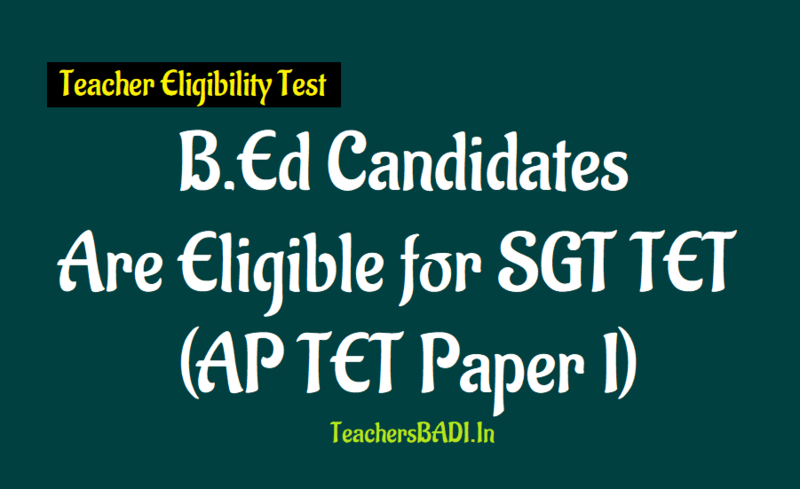 B.Ed Candidates are eligible for SGT TET (AP TET Paper I), B.Ed is Eligible for SGT AP TET Papper I, B.Ed Candidates to write SGT Post: AP Education Department has issued an opportunity to write a Secondary Graduate Teacher AP TET Paper I for the Bachelor of Education (B.Ed) Candidates. 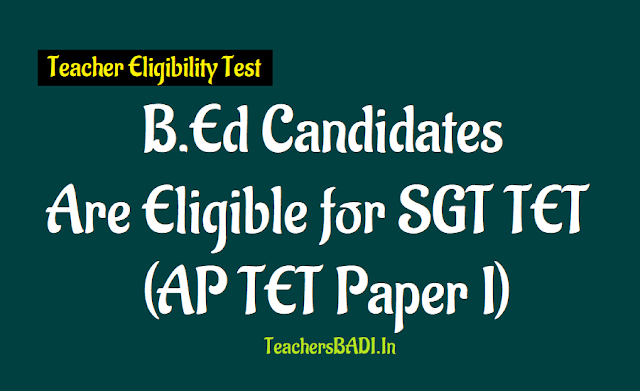 According to these orders, B.Ed candidates are eligible for Paper-1 AP TET. These orders were issued in the backdrop of DSC. This order was issued after a recent National Teacher Education Council (NCCT) issued a Gazette notification granting B.Ed Candidates to write SGT Post. School Education Department - Guidelines for conducting Andhra Pradesh State Teacher Eligibility Test (AP-TET) under Right of Children to Free and Compulsory Education Act (RTE), 2009 - Amendment - Orders - Issued. 1. G. O. Ms. No.25, School Education (Exams) Department, Dated: 04.05.2018. 2. G. O. Ms. No.27, School Education (Exams) Department, Dated: 31.05.2018. 3. NCTE Notification in F. No. NCTE-Regl. 012/16/2018, dated 28/6/2018. 4. From the Commissioner of School Education, Andhra Pradesh Lr. Rc. No. 01/TET/2018,dated 20/8/2018. 2. In the circumstances stated by the Commissioner of School Education, Andhra Pradesh, Ibrahimpatnam in the letter 3rd read above, and after careful examination of the matter, Government hereby issue the following amendments to the aforesaid guidelines issued in G. O. Ms. No. 25, School Education (Exams) Department, Dated:04.05.2018. (i) Intermediate / Senior Secondary (or its equivalent) with at least 50% of marks. However in case of SC/ST/BC/ Differently abled candidates, the minimum marks shall be 45% and a Pass in 2-year Diploma in Elementary Education / 4 – Year Bachelor of Elementary Education (B.El.Ed.) / 2- year Diploma in Education (Special Education). ఎస్జీటీ టెట్‌కు బీఈడీ అభ్యర్థులకు అవకాశం: బ్యాచిలర్‌ ఆఫ్‌ ఎడ్యుకేషన్‌(బీఈడీ) చేసిన వారికి సెకండరీ గ్రేడ్‌ టీచర్‌(ఎస్జీటీ) ఉపాధ్యాయ అర్హత పరీక్ష(టెట్‌) రాసేందుకు అవకాశం కల్పిస్తూ విద్యాశాఖ ఉత్తర్వులు జారీ చేశారు. ఈ ఉత్తర్వుల ప్రకారం పేపర్‌-1 టెట్‌కు బీఈడీ అభ్యర్థులు అర్హులు. త్వరలో డీఎస్సీ నిర్వహించనున్న నేపథ్యంలో ఈ ఉత్తర్వులు ఇచ్చారు. ఎస్జీటీ పోస్టుకు బీఈడీ చేసిన వారికి అర్హత కల్పిస్తూ ఇటీవల జాతీయ ఉపాధ్యాయ విద్య మండలి(ఎన్‌సీటీఈ) గెజిట్‌ నోటిఫికేషన్‌ జారీ చేసిన నేపథ్యంలో ఈ ఉత్తర్వులు జారీ చేశారు. (ii) ) Intermediate / Senior Secondary (or its equivalent) / Graduation with at least 45% of marks. In respect of SC/ST/BC/ Differently abled candidates, the minimum marks shall be 40% and a Pass in 2-year Diploma in Elementary Education / 4 - Year Bachelor of Elementary Education (B.El.Ed.) / 2-year Diploma in Education (Special Education) / Bachelor of Education (B.Ed.) , in case of the candidates who have passed or admitted to D.El.Ed. / D.Ed. / B.Ed. course prior to NCTE Gazette Notification, dated 23/8/2010. Note: Who has acquired the qualification of Bachelor of Education from any NCTE recognized institution shall be considered for appointment as a Teacher in Classes I to V provided the person so appointed as a teacher shall mandatorily undergo a six months Bridge Course in Elementary Education recognized by the NCTE within two years of such appointment as Primary Teacher.